Oil on panel, 76,5 x 59 cm. 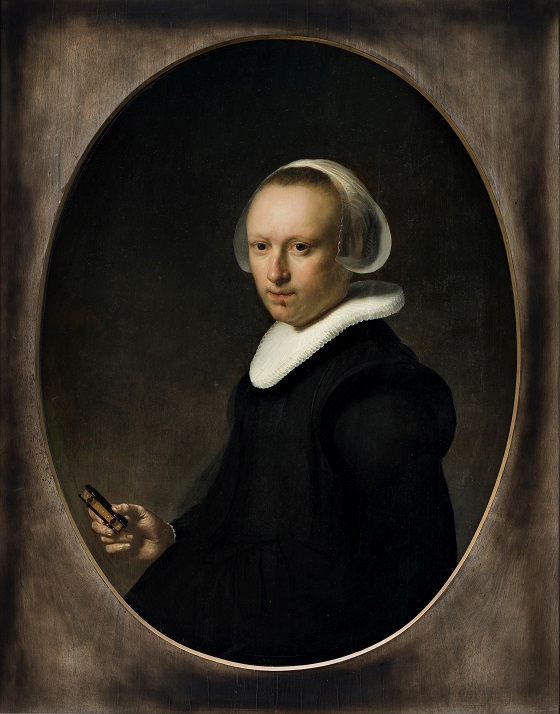 She appears serious and shy, this Dutch bourgeois wife with the tightly combed hair and prominent forehead. She belonged to a religious sect, the Mennonites, who emphasised a devout and ascetic lifestyle. The face and the piped collar are strongly highlighted, an example of Rembrandt’s characteristic way of working with the chiaroscuro technique. The hand with the prayer book is an addition of a later artist, who perhaps wanted to add dynamic to the composition or emphasise the model’s piousness. The portrait is the only by Rembrandt in Denmark which authenticity has never been doubted. Rembrandt’s art belongs among the greatest and most significant productions in European art. His output consists of over 2000 works, which include paintings, drawings and prints. Rembrandt mastered all genres, but it was particularly within portraiture and religious history painting that he excelled. The dramatic use of light and accentuation of the momentary, the unique and the individual qualities of his figures and portraits are some of the characteristics that make Rembrandt’s art visionary. In posterity, his theatrical scenes, his interest in the materiality of painting and the Christian-humanist view of humanity has had an immense influence on painters, photographers and filmmakers alike.